It’s more than simply being a place for people to live, work, and play. Gretchen Swanson of Long Beach, California will tell you a great neighborhood happens once residents realize it’s in their power to take action to make a difference in their community. Gretchen heads up Long Beach’s Rose Park Neighborhood Association, so it’s no surprise she has strong views on neighborhood character. Sitting just outside Los Angeles city limits, Long Beach blurs the line between urban and suburban, beach town and city, cozy and cosmopolitan. Its Rose Park neighborhood is a densely populated historic area with more than 10,000 residents in a half square mile. Many Rose Parkians, as some call themselves, are long-term renters who have lived in the area for decades. At the end of 2017, Gretchen was approached by Terri Griffith, president of Rebuilding Together Long Beach, and Commander Liz Griffin of the Long Beach Police Department East Division with an idea for an unconventional project in Rose Park called Light Our Night. Almost a year earlier, Terri had approached Commander Griffin about a potential partnership to improve neighborhood safety. Terri suggested the idea of installing exterior lighting on buildings for better visibility at night. The police’s neighborhood service specialist, Ruth Anne Salau, identified a few blocks in Rose Park with higher rates of property crime that could benefit from more lighting. And that’s when Terri and Commander Griffin pitched the idea to Gretchen at the Rose Park Neighborhood Association. A partnership soon formed, and Light Our Night accelerated from bright idea to pilot project. 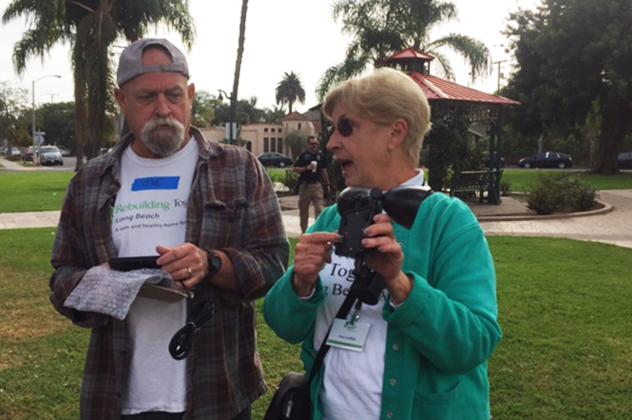 Rebuilding Together Long Beach negotiated a discount on the right kind of solar-powered, motion-sensor outdoor security lights and also helped the partners navigate liability issues. 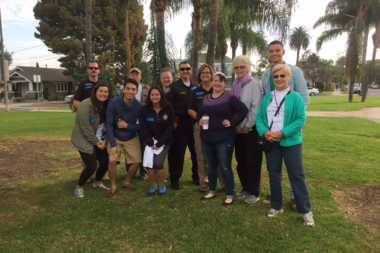 Over several weeks, police and Rebuilding Together Long Beach staff went door-to-door to determine which areas needed brightening, and to ask residents, landlords, homeowners, and businesses for permission to install lights on their property. Rebuilding Together Long Beach applied its formidable community organizing skills to coordinate the installation of the lights. It brought drills, ladders, and other equipment, and trained the volunteer crew how to use everything safely. It got Rivera’s Mexican, a popular neighborhood restaurant, to donate lunch for the volunteers. When the first installation day was rained out, Rebuilding Together Long Beach rallied volunteers to return over two more days to get the job done. 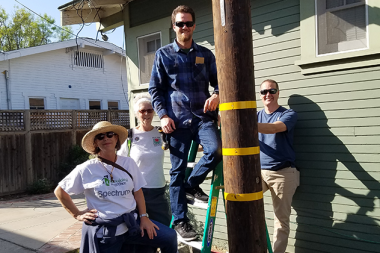 Over several Light Our Night installation events, volunteers have included staff from the office of City Councilwoman Jeannine Pearce, police officers and department employees, Rebuilding Together Long Beach staff, and residents. The partners have installed dozens of lights in alleyways, on the sides of buildings, and in other nooks where nighttime visibility was poor. In community meetings and in conversations on the streets, the partners have heard the results they hoped for. People’s perception of safety has improved. Rose Park residents talk about how much better they feel now that they can see what’s going on and where they’re going. They say they’re more comfortable going out at night and talking with their neighbors.